Smith & Brown on the corner of Sydney Street : click on image to open a large version in a new window. My Dad was born at 58, Russell Street in 1893, and lived there until his marriage at St. Paul’s Church in 1922, with a break for war service. After persistently volunteering he was accepted for the Army Ordnance Corps and he became a member of a team who dumped dud ammunition in the middle of the Channel on a ship from Boulogne-sur-mer. Those of you who use the Channel Tunnel should spare a thought for the cordite lying above you – I know I do. My grandfather was Albert Thomas Why, who had married Annie Cox in Cranfield, Bedfordshire but his family originated in Hurst, Berkshire. Grandfather migrated south, and first became a fishmonger in Baker Street, but moved to Russell Street to become an oyster merchant. His meagre earnings seemed to have been boosted when the large hotels ran out of oysters at a busy time. We were poor, and my Mother said she couldn’t wait to get him away from the place to create a lovely comfortable home for us. But he said the great advantage was that he could hear the performances on stage at the Alhambra Music hall on the sea front. He actually recalled seeing Charlie Chaplain as a boy, shooting peas at his troupe from a box at the side of the stage, long before he left for America. He was a good source of music hall songs which he taught me and we often visited the Hippodrome where I first saw Julie Andrews as a small girl, with her parents Bob and Barbara Andrews. My Father went to work, after attending Pelham Street School, at Messrs. Smith & Brown, Co-operative Clothing Store, at the junction of Trafalgar and Sydney Streets. He could be seen, serving customers from all over Sussex, always with his measuring tape hung round his neck as his badge of office. Apart from war service he was there from 14 until 68 years old. When I came home on leave from National Service it was a pleasure to first pop into the shop to greet him as I came down from Brighton station. Finally, clutching his gold watch, he enjoyed retirement until he was 78 years old. So poor Russell Street you are buried beneath that monolith, with all your memories left in our hands. The last visit I paid to the Alhambra Cinema, was to see the film ‘Genevieve’ with its marvellous cast of British film actors. My memory of my grandfather is but one, when as a boy, perhaps 4 years old, on a wet day he took me to the back yard and hand in hand, we watched the raindrops bouncing on the cobbles. Each one he said, was somebody going somewhere to do something; a person dodging the rain, a horse and cab trotting through the gloom or a delivery van with the driver being soaked on his seat controlling the horses. What an imagination the old man had. At 81 my world has changed beyond recognition and not always as I would have wished but I shall not forget. I came across this page recently by Kenneth Why and remembered that I had taken a photo of the shop a couple of years ago when the original sign for ‘Smith & Brown’ was exposed. It got me thinking that this store must have been a part of many ‘Brightonian’s’ lives as it had traded as a clothing store for a long time. 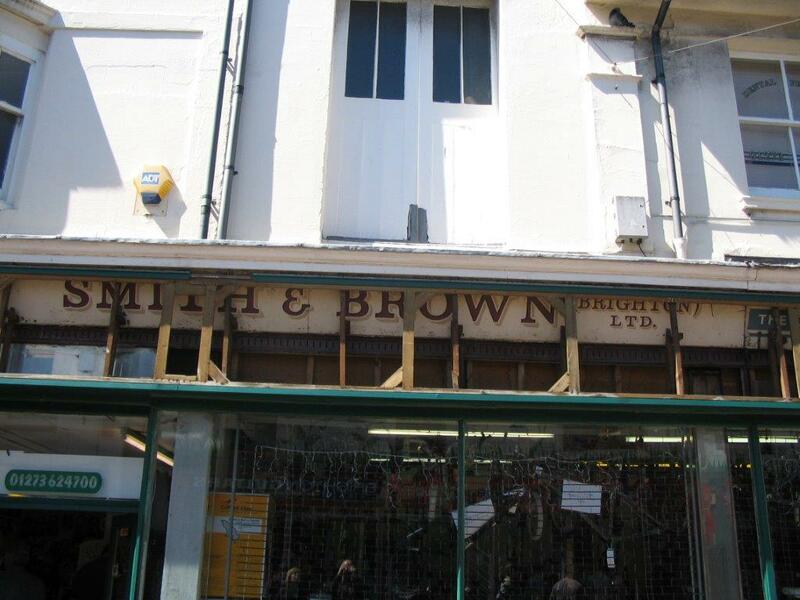 The first entry in the directories as a clothing store was in 1899 as ‘Co-operative Clothing Store’ and over the years the names ‘Smith’ or/and ‘Brown’ are present. What a great story for Kenneth to tell us all that his father worked there for 54 years. I think it’s a lovely thought that my Grandparents and even my Great Grandparents may have shopped there. My Dad was born in Redcross Street in 1929 so I’m pretty certain that he, or his Dad may have used the shop. I myself remember going into the shop in the 60s when I started Secondary School, I believe it was to buy my first school blazer and trousers. (I didn’t go into long trousers until I was 11). I’m pleased to have added my photograph to a great story and hope it gets people remembering ‘Smith & Brown’s’ of Sydney Street.